I know that banana soft serve is not a new recipe..there are about a million variations and riffs on the classic and even an appliance that promises to make it for you with no muss and no fuss! But I think it is worth repeating! It is truly one of my most favorite desserts and a real go to recipe when I want something quick, easy and tasty. It doesn’t hurt that my daughter absolutely loves it! That is it! Now you can have fun with all the add-ins! That is it! 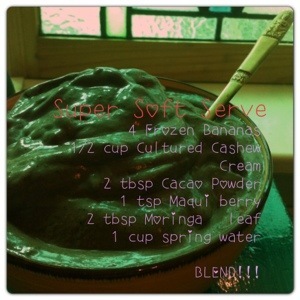 Take your bananas and flavors/powders and put them in the food processor with a little of whatever liquid you are using. Turn it on and watch it transform into a creamy delight right before your very eyes. Add more liquid little by little if your food processor is finding it hard work.